To compare the short- and long-term clinical outcomes of the double-bundle (DB) anterior cruciate ligament (ACL) reconstruction with those of single-bundle (SB) ACL reconstruction. An electronic search of the database PubMed (1966–September 2011), EMBASE (1984–September 2011), and Cochrane Controlled Trials Register (CENTRAL; 3rd Quarter, 2011) was undertaken to identify relevant studies. Main clinical outcomes were knee stability measurements including KT-1000 arthrometer measurement, Pivot shift test, and Lachman test, and clinical outcome measurements including International Knee Documentation Committee (IKDC), Lysholm knee score, Tegner activity score, and complications. Eighteen studies were finally included in this meta-analysis, which were all classified as high risk of bias according to the Collaboration’s recommended tool. 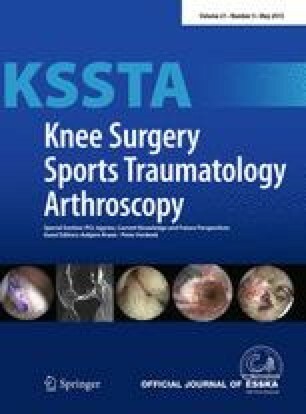 It is seen that compared to SB ACL reconstruction, DB ACL reconstruction results in a KT-1000 arthrometer outcome 0.63 and 1.00 mm closer to the normal knee in a short- and long-term follow-up, respectively. Our results also reveal that DB-treated patients have a significantly higher negative rate of the pivot shift test (p < 0.00001 and = 0.006 in a short- and long-term follow-up, respectively) and Lachman test (n.s. and p < 0.0001 in a short- and long-term follow-up, respectively) compared to SB-treated patients. As for the clinical outcome measurements, a significant difference is found between SB versus DB ACL reconstruction regarding the IKDC (p = 0.006 and < 0.0001 in a short- and long-term follow-up, respectively) and complications (p = 0.03), while there is no significant difference between the two groups regarding Lysholm knee score (n.s.) and Tegner activity score (n.s.). Overall, double-bundle ACL reconstruction yields better clinical outcomes when compared to single-bundle ACL reconstruction. There are no further sources of funding for the study, authors, or preparation of the manuscript.